To spoil, or not to spoil, that is the question. Actually for me it’s not much of a question because I can’t bring myself to do so but I will say that something dramatic happens about 90 odd pages into this book that, if I’d known about it in advance, might have prevented me from reading it. Which would have been a shame as it’s a thoroughly enjoyable romp. If you’re similarly interested in a bit of a surprise then I advise caution when reading other reviews. I tackled this book with no prior knowledge other than having read several of the author’s books in another series but have now had a look at several reviews and most of them give away things you’re far better off not knowing before it’s time. I will admit though that not mentioning this particular event and its subsequent implications does make discussing the book’s plot somewhat challenging. So I’m hardly going to discuss it at all. Aside from enjoying Ellery Adams’ other work, what prompted me to pick this book up is its setting: a resort for book lovers. As someone who likes to read ‘in the wild’ so to speak (i.e. away from home) the notion of a place set aside for – indeed designed especially for – people who read was too good to pass up. I immediately imagined what it might be like. No piped music. No TV bolted to the wall blaring some sporting event or what passes for news these days. No filling in the blanks as you’re forced to eavesdrop on the shouted, one-sided conversation of the idiot on an iPhone at the next cafe table. No one assuming you’re ‘doing nothing’ because you’re sitting in a comfy chair with a book so they start a conversation about their bunions or some other inane topic of no interest to anyone but themselves. I have grown weary enough of my increasingly elusive search for a quiet place to read other than my own lounge room that I was eager to escape into a fictional version of my quest. The book did not disappoint. It is set in Storyton Hall, the ancestral home of the Steward Family that has been re-purposed as a retreat for book lovers. Adams makes it delightful. Rooms full of books. Rules that require guests restrict use of their electronic gadgets to their rooms. Plenty of places to sit, relax, absorb, be. Alone or with others. Activities to participate in if desired. No pressure to do so if not. Enough nearby shops to cater to one’s immediate needs but no characterless shopping malls within shouting distance. I’d book a room in a heartbeat if this was not a fictional location. Jane Steward, widow and mum to twin six year old boys, has taken over as the resort’s manager. As a way to attract more business she decides to host a themed week of events for mystery lovers but, as you might expect, not all the murder and mayhem that follows is scripted. Unlike in most cosy novels, this book’s amateur sleuth does not tackle investigations on her own. In fact she is replete with helpers in the form of family, faithful servants and staff and the members of her book club (the charmingly named Cover Girls). Even her sons get in on the act. Together and individually this is an engaging cast of characters. I think my favourite is Jane’s Aunt Octavia: devoted wife, obstinately unhealthy, fiendishly clever octogenarian. 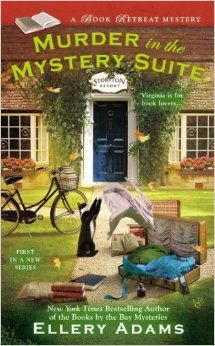 MURDER IN THE MYSTERY SUITE reads like an Enid Blyton book for grown-ups. It has all the fun, daring and friendships of a Famous Five novel with adultier additions like cocktails, a dash of romance and serious motives for criminal undertakings. It is, of course, entirely absurd but once you have suspended your disbelief there is an undeniable internal logic to events and it’s easy to get carried away with the adventure of it all. I think that place sounds completely delightful! Truly. I’d book a room too. Went looking to see if I already owned it and sadly, no. And I’m not buying right now. Sigh. My library does have it, but it’s checked out. Have put it on hold, with 2 people ahead of me. I may break down and buy it anyway. You did a good job with not sharing too much and I don’t want to talk about someone’s bunions either. Ick! Not sure about the book, but definitely want the retreat. This one sounds good Bernadette. Read the other reviews of William Boyd too, heard so much about Boyd and out of curiosity I may want to pick up one of his books!